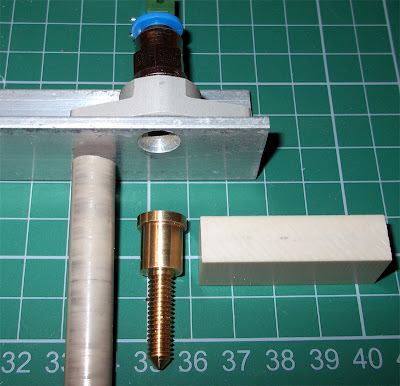 I am a big fan of using off-the-shelf parts where possible in Reprapping, so using Pneumatic Push-fit connectors was an obvious choice for attaching the PTFE (bowden) tube to my extruder assembly. 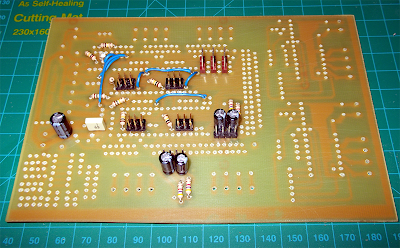 The other standard part I always try to use is the metal rail mounts shown above. They work well as a clamp and are low cost (£2 / $3) and easy to modify. 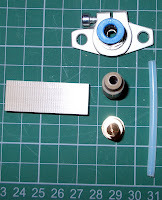 I'm using a simple Aluminium R/A piece to mount to my Repstrap, you could use something different to mount to Mendel, Prusa or Rapman machines. 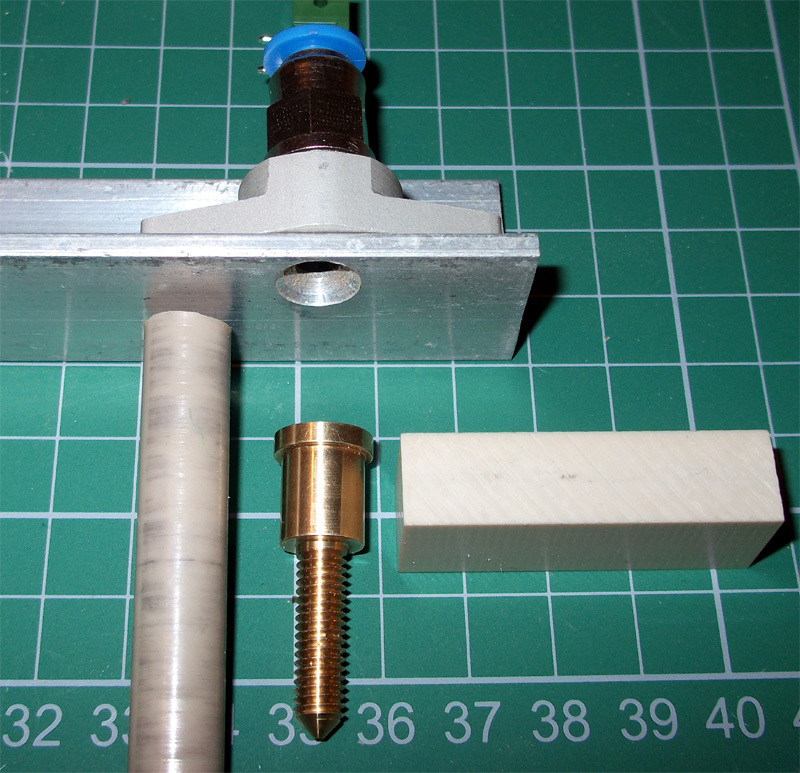 10mm PEEK rod and block, 1.75mm Hot-end with 0.35mm Nozzle. 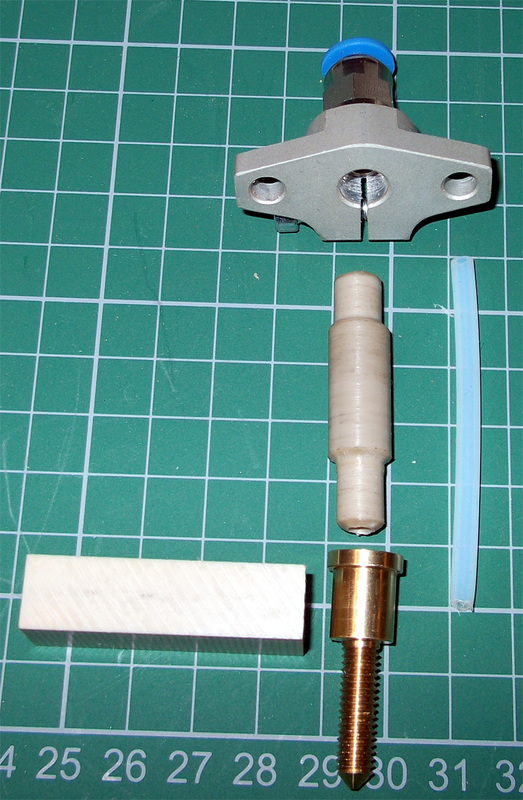 Turn down both ends of the PEEK rod (one 7.2mm and the other 8mm). 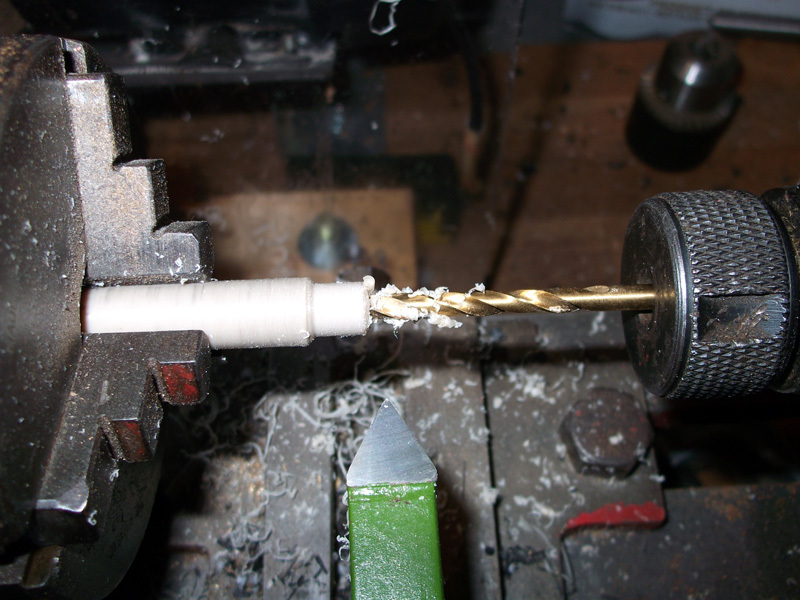 Then with a 4mm drill bore the barrel - the PEEK will expand and shrink so the hole will be undersized, but that's good. 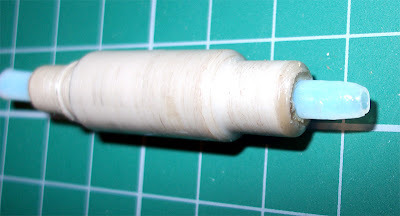 Cut a length of 4mm (outer) PTFE tube. Then you need to push the PTFE tube into the PEEK barrel, this is hard so taper the tube end with a pencil sharpener and force it in, you may need some PTFE spray to help this process. 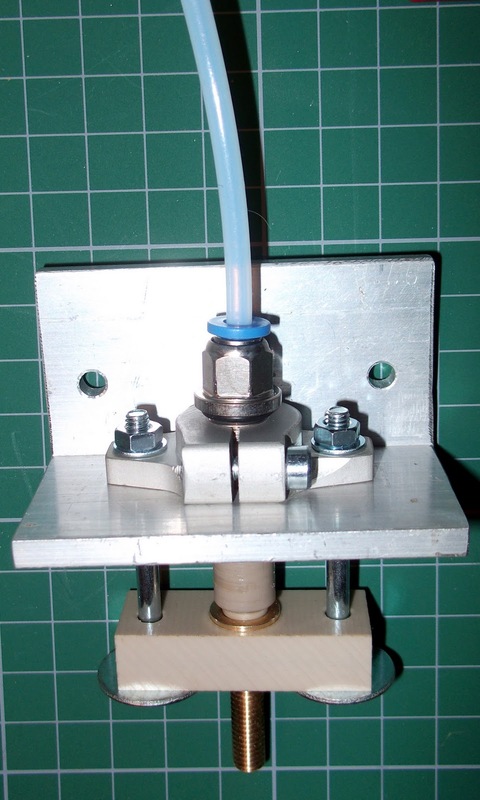 Cut down the tube but make sure to allow both ends of the tube to compress slightly, one in the push-fit end and the other in the hot-end, you can tighten down the push-fit after it's all at temperature as the PTFE tube will elongate with temperature, you don't want any leaks. 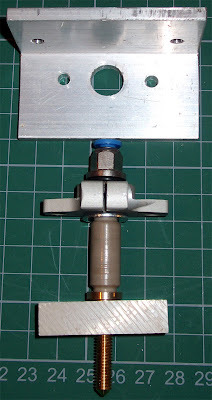 Drill your PEEK block so it has the same spacing as the rail mount. 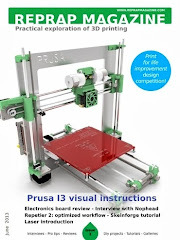 Drill your chosen mounting bracket. 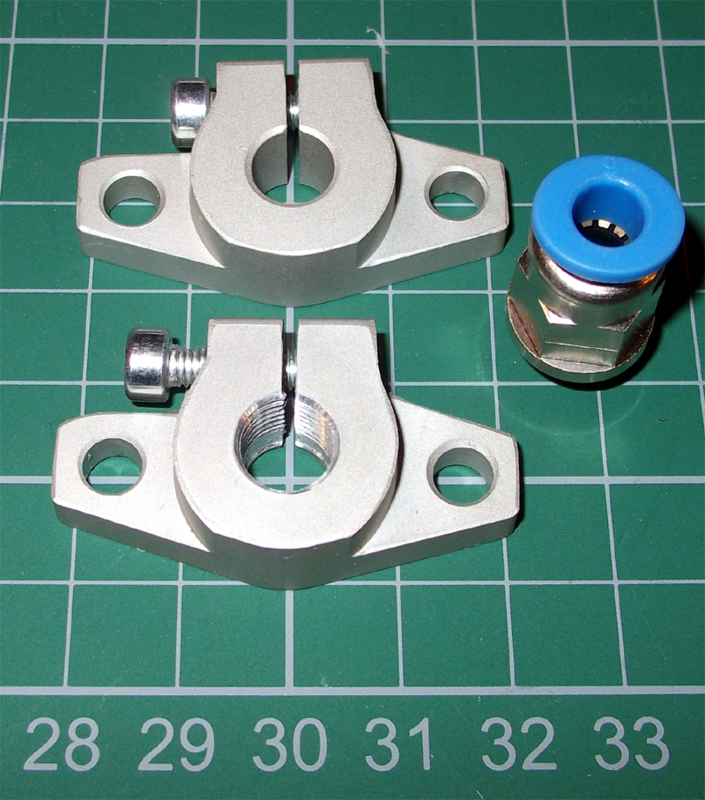 Assemble with 55mm M4 bolts, washers and nuts, you can use a Nyloc nut at the top, it should not get hot enough to melt them. You will need to tighten everything after it gets up to temperature for the first time, the PEEK will bend. 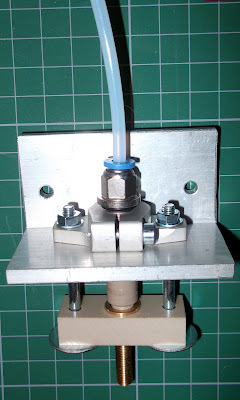 The other end of the PTFE tube is connected via a push-fit on the Extruder, so the 1.75mm filament can be driven down the tube to the hot-end. I hope to have some examples of it running soon, I now have the last remaining Pololu stepper drivers, so I can start to wire-up the ScrewBall strap and get back to 3D printing (another 3D printer) ! 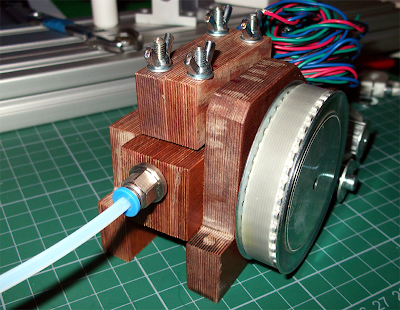 Bowden Extruder - DIY RepStrap build for 1.75mm or 3mm Filament. 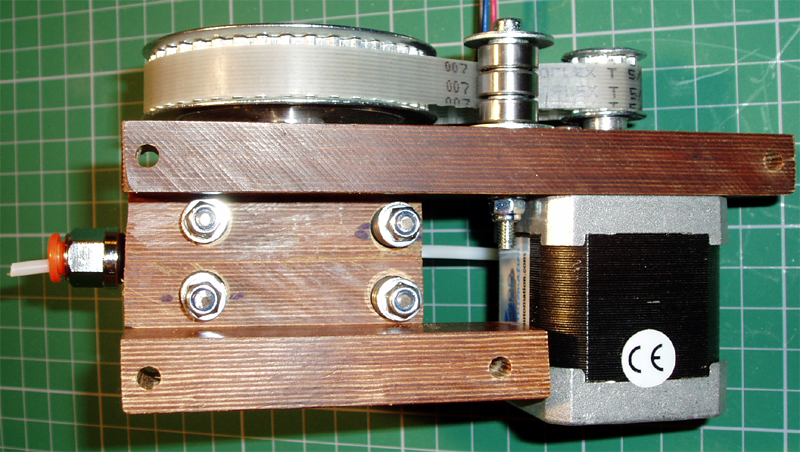 So for my new Repstrap (ScrewBall Strap) I am going to be using both 1.75mm and 3mm Filament, with a dual extruder set-up (eventually). 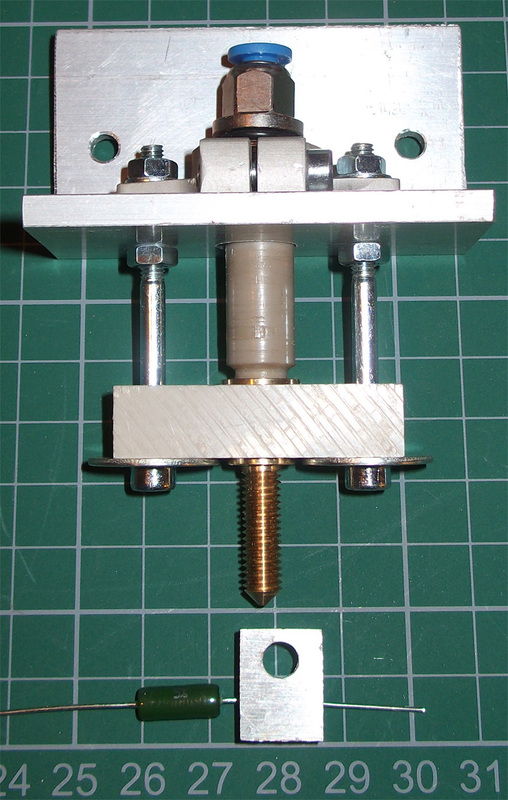 I will of course print one of Adrian's new Mini extruder's and have a go at using a NEMA11 motor in a Bowden configuration at some point, but for now here is how this one was made and assembled. 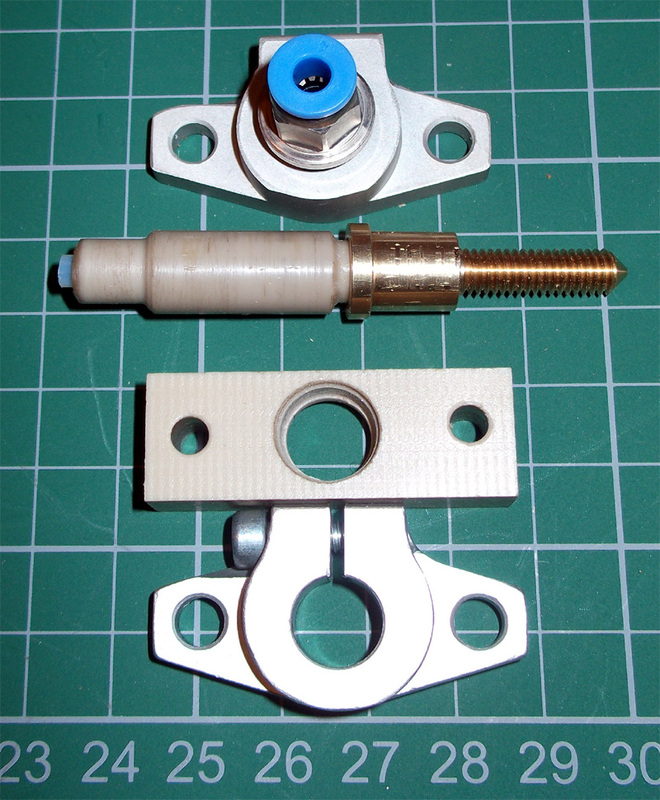 Top shows the filament drive path and Pneumatic Push-fit connector for standard 4mm or 6mm PTFE tube. Middle is Idler bearing block. Bottom right is Nema17 motor mount. Close up of Pneumatic connector - tapped and screwed, PTFE tube can easily be fitted and removed. 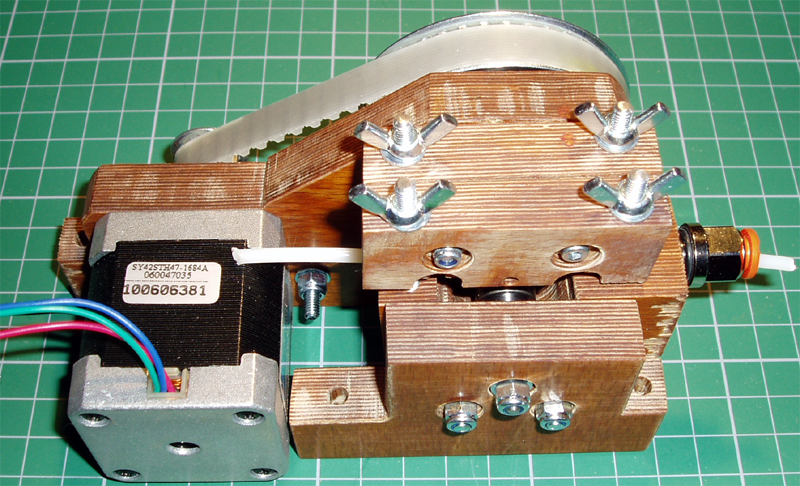 I decided on a 10mm belt-driven drive-train (belt is 280mm) Pulley's are 16 and 40 teeth. 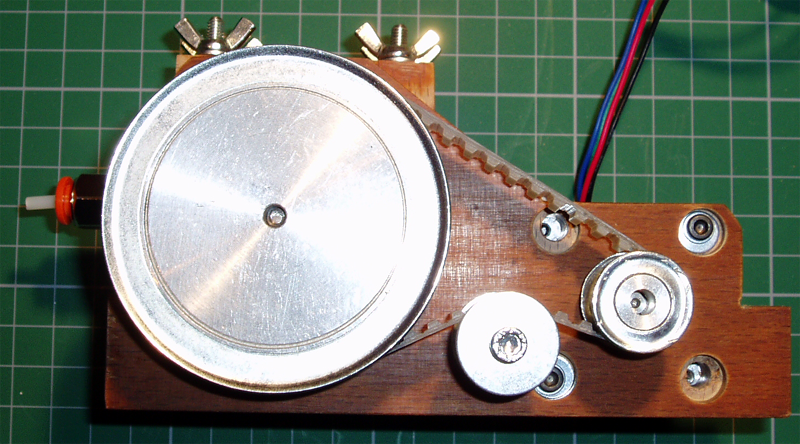 I wanted a straight-through filament drive so it's easily mounted on my RepStrap and could be made to tilt as printed build-height increases. Underside - Excessive use of bearings for a belt-tensioner I know. I mounted the 4 springs recessed inside the bottom block, so I can just use normal wing-nuts on the top idler block, this makes it much easier to take apart to clean and reduces the total height by using dead space for the springs inside the extruder body instead of sticking out the top. 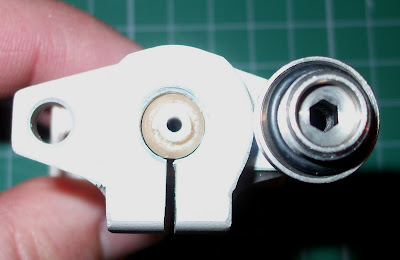 This has 3mm ABS coming out of the 6mm Push-fit Pneumatic connector, but it's just as easy to screw in a 4mm for 1.75mm Filament drive. I'm sure this design could easily be printed so If it all works well I will try to print a copy of itself and post some design files. And I really like the Herringbone Gears, so I expect that will replace the belt-drive in a printed model. 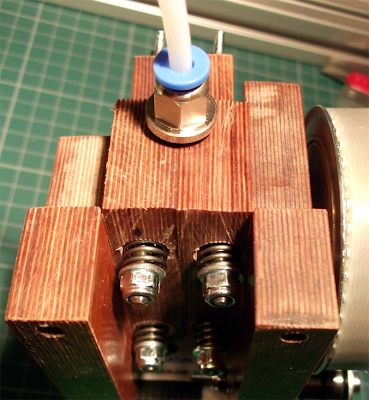 I also think the internal compression springs idea could be incorporated into other extruder designs, it really makes filament change and cleaning a much easier job than having to remove the springs each time. 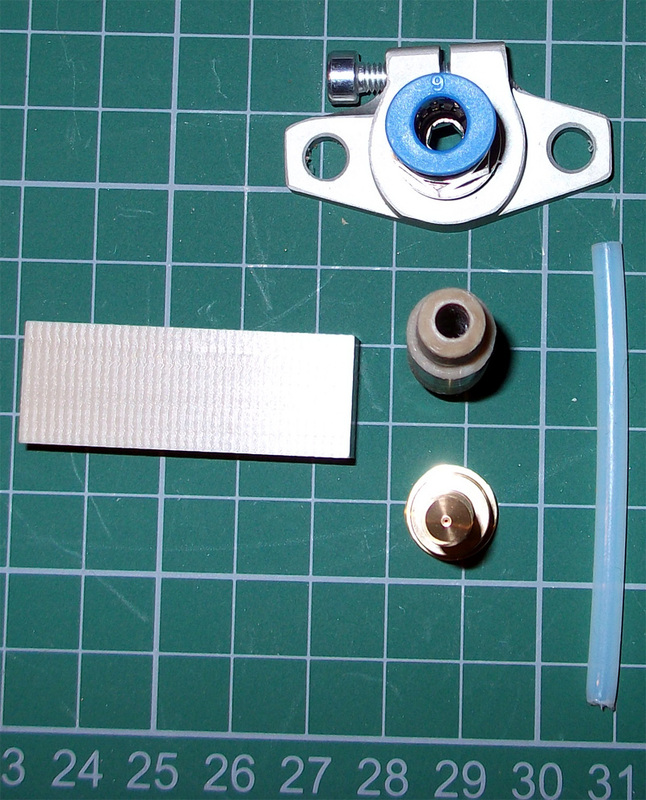 I have also made a new 1.75mm hot-end for this Bowden driven Extruder, I'll post that and how I made it tomorrow. 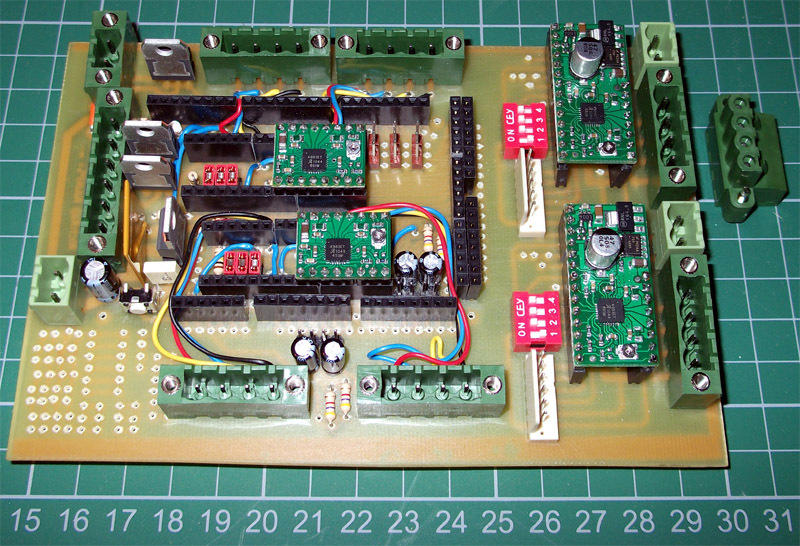 But by 18th march they should start to ship out more Pololu steppers to people, so hopefully I can test it fully around then. 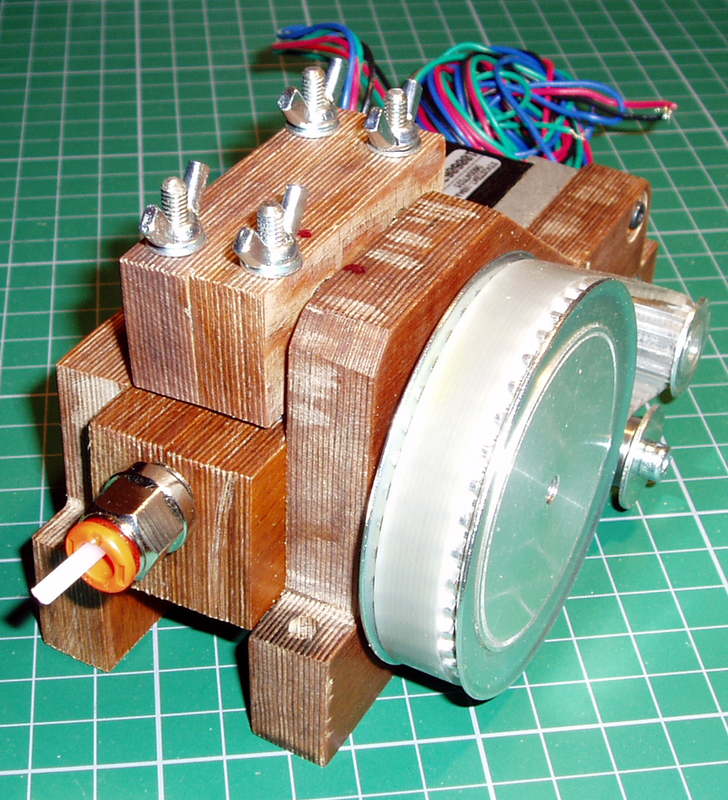 And while I waited for those I have just finished my first Bowden Extruder with a 1.75mm filament drive and my own design of a push-fit style hot-end, photo's and more on that tomorrow. 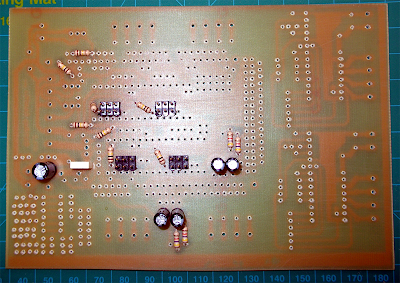 I printed (Toner Transfer) another RAMPS+ PCB, this time with standard FR4 material, 1oz Copper. 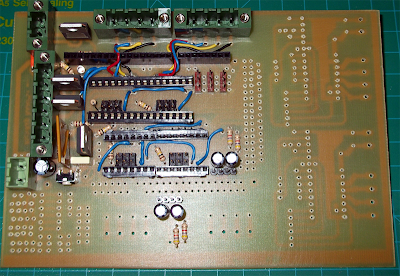 The RAMPS Wiki page is missing a good Component Ident (silk screen), if I get time I will upload one, so it's hard to see what parts I have fitted, but as with all DIY PCB assembly, you should try to start with the lowest components first and fit the tallest ones last. 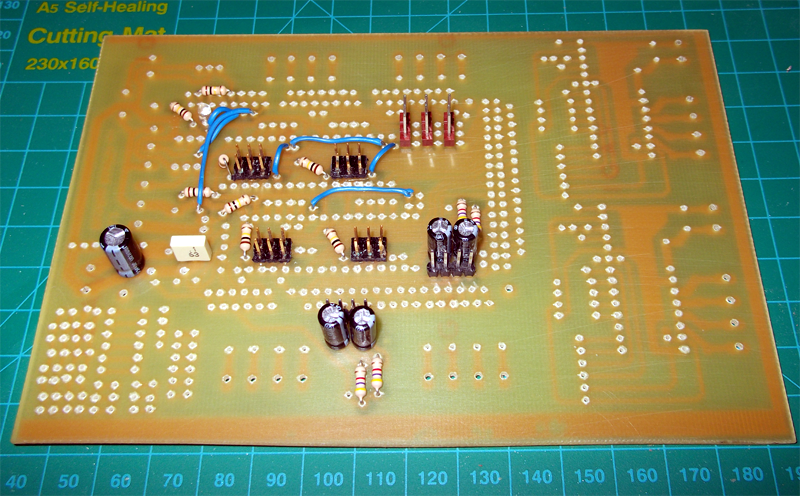 Single sided RAMPS boards need a few wire links on the top, some in blue here. 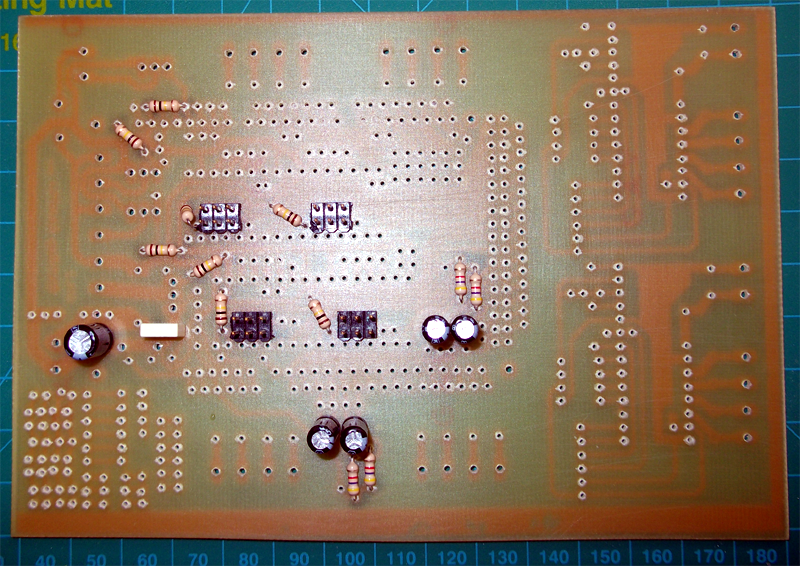 the 6way 0.1" headers select the Stepping mode for the Pololu carrier boards. 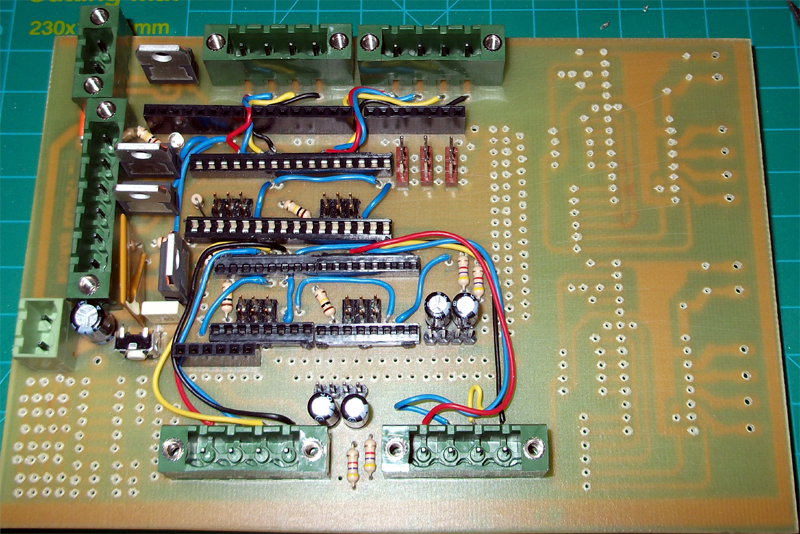 I'm using Screw down terminals for motor and Mosfet outputs. 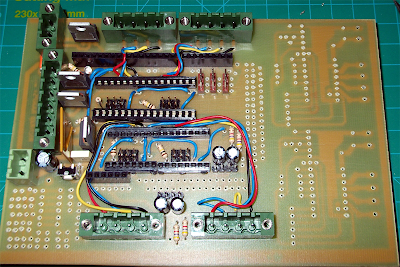 The RAMPS layout does not really provide much room for slightly chunkier components, I will give everything much more room on the PCB when I layout my new electronics design. 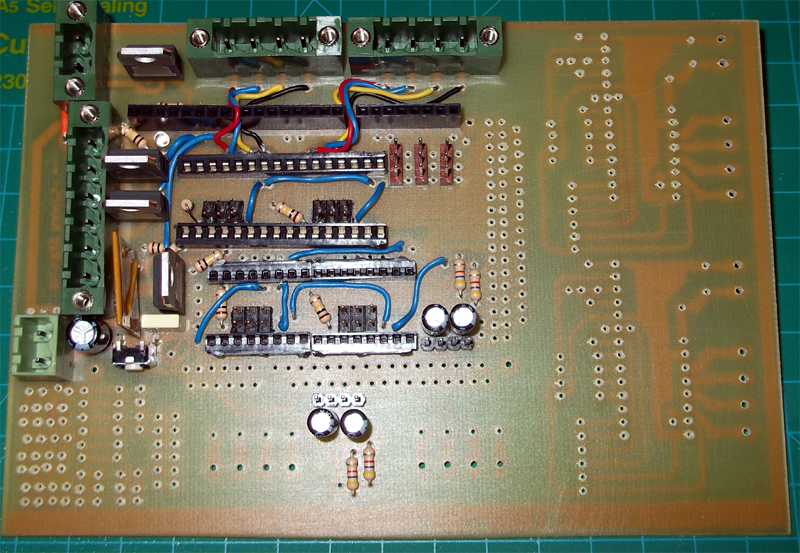 About 80% completed. I'm not going to fit the 2nd and 3rd extruder positions at the moment.